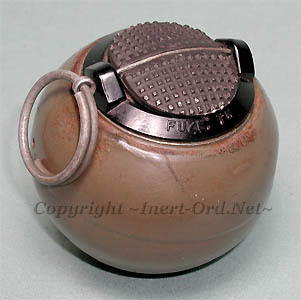 Towards the end of WWII, this specialized hand grenade was developed for the OSS (Office of Strategic Services). 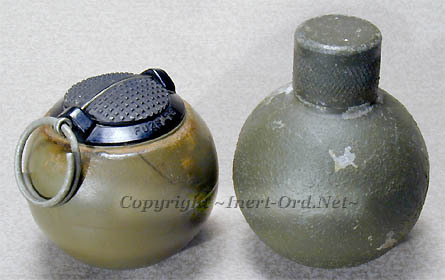 Their requirements were for a baseball sized fragmentation grenade with an impact fuze. Nicknamed the "Beano", it has a smooth steel body (.04" wall thickness) with a diameter of just under three inches. 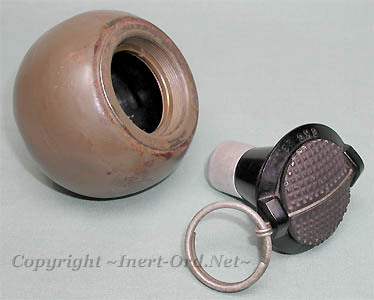 In use, it is held with the safety cap under the fingers, the pin is pulled and the grenade thrown. The grenade arms as it travels through the air. It had a 20 meter effective radius. The problems were more or less worked out and the grenade was adopted for use as the T13 in January 1944. The term "Beano" was used prior to the formal type designation. While the T13 was shipped to Europe for field evaluation, it isn't clear if it was ever used in combat, although there is unverified information it was issued in limited numbers to troops for the Normandy Invasion. The first fuze design, T5, is shown here partially deployed. 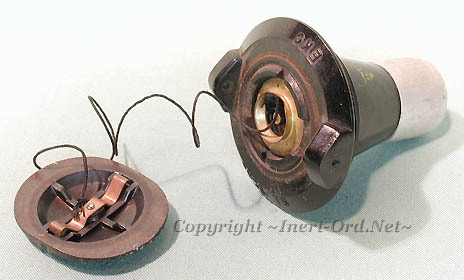 The spring loaded cap departs and the lanyard pulls an arming pin from the fuze body. Internally it is an "always fuze" design. The letters "EKC" stand for the manufacturer, the Eastman Kodak Company. Beano fans....Don't skip this page! The ball grenade concept was further explored with an offensive grenade design. The T15 grenade (at right) is almost entirely of magnesium construction with a special textured paint finish for a better grip. It used a simple "strike anywhere" percussion time fuze under a protective screw cap. The T15 was never adopted for use.